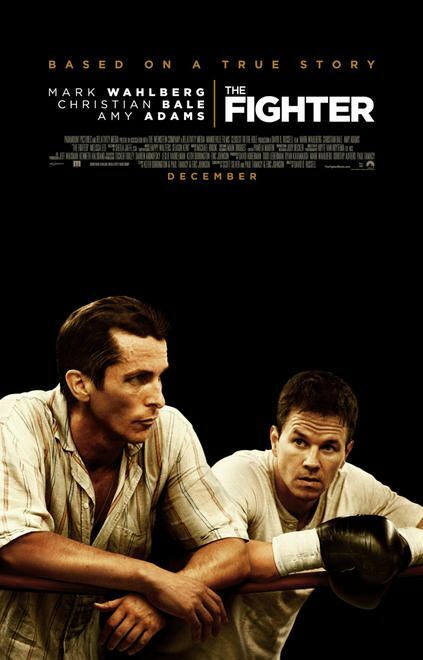 I’ll get right to the point: The Fighter is a stunning film and near perfect. Watching the trailer and reading the glowing reviews including from this forum, something still wasn’t clicking for me. On paper, it’s easy to be cynical about a film that was so easily nothing more than Oscar-bait; a true story, complete with triumph over adversity emotion and plenty of dialogue for award starved actors to chew on. But in truth, it genuinely deserves all the plaudits and away from all the nonsense and analysing it’ll get subjected to, it’s just a bloody good film. A great film, in fact. I thought the boxing movie was done and dusted, with nothing more to say after Rocky and Raging Bull, but David O. Russell’s film is truly magnificent. At the centre of the film are brothers Micky Ward (Mark Whalberg) and Dicky Eklund (Christian Bale). Dicky is an ex-boxer, addicted to drugs, but still devoted to training his younger brother, who is looking for his first major win. It’s a family affair throughout, as his manager is also his mother, Alice (Melissa Leo), but a dysfunctional family nonetheless. Micky is losing faith, Dicky is heading for jail and Alice is obsessed. Micky’s faith is restored by Charlene (Amy Adams) and the story follows his attempt to give his life some meaning and independence, while his brother seeks redemption. You’re probably yawning already. Another boxing drama? Really? Yes, really. And it’s a true life drama, which just makes it worse, doesn’t it? Biographical films rarely work properly, because life doesn’t have the decency to follow an interesting narrative. They so often become too sprawling and obvious to focus attention or concentrate too much on the subject. But the genius of The Fighter is in its screenplay, which is very clever and sharp. Most important of all, it isn’t predictable and frequently surprises. It gives in a little to sports movie convention in the second half, but that’s by necessity and it just couldn’t run without it. This is no dark introspective Raging Bull, but a more optimistic and likeable story. It might be Micky’s story, but both brothers are important and it moves focus between them beautifully. The dialogue is sparky and frequently funny, especially in the family scenes. Don’t underestimate any of them though. Micky and Dicky’s mother, Alice (Melissa Leo), is especially powerful, convincing as both loving but obsessed, to ruthless yet deluded. Plus she’s like a gang leader with half a dozen daughters in tow, ready to defend the family by any means, even against long suffering dad George! There actually isn’t a duff note in the cast at all. Amy Adams for instance could easily have got saddled with a basic girlfriend role, but her sassy delivery makes her impossible to dismiss, just perfect for her character, especially when she takes on that formidable family. Christian Bale is getting a lot of attention during this awards season and it’s a shame that Mark Whalberg isn’t, but Bale does deserve his share. His role as the fidgety, crack-head older brother should be an obvious side-kick one-note performance, but the screenplay gives him great material to round out the character with and he is superb following his own path. The two work together perfectly with Whalberg being so quiet and subtle and again, note perfect. This is by far Whalberg’s best role and to be frank, I never thought he had it in him. In fact a few years ago, rumours suggested he was walking away from acting. Very glad he didn’t as he puts everything into this part. All the main roles have to have a fine balance and David O. Russell is either a genius for pulling them altogether or very lucky. Judging by his directing though, I’d go with the former. Russell directs like an early Scorcese, with none of the indulgence of post-Goodfellas Scorcese. Some shots are breathtaking, and not just in the fight scenes, mainly because it’s always driven by the characters so every visual decision is grounded. Use of sound and editing is incredible too; when the two brothers are entering one of the fights to a chorus of boos drowning out Micky’s walk-on song, they sing it quietly to themselves instead. The film has a fluid style that flows effortlessly, perhaps mirroring the grace of the boxers in the ring, and it makes it very watchable even in the most powerful scenes. It’s an exhilarating experience watching The Fighter. If like me you were ready to dismiss it because it’s release is conveniently timed in the awards season and it looks like more than one person involved is making a shameless bid for recognition, then just try to ignore all the nonsense and see it for what it really is. A genuinely powerful story with substance that’s a lot of fun too. I thought that was one of the Oscar nominees that I could safely skip. Mostly, because boxing movies are really not my thing (the only reason I even took notice of the movie were Amy Adams and Melissa Leo ), but also because I apparently did read only the negative reviews. The weakness of the film is the weakness of the leading role. That's not a criticism of Mark Wahlberg, who has a quite capable range, but of how he and Russell see the character. The Fighter is, in terms of structure and tone, as traditional as a left-right combo. Having previously exhibited a flair for somber, idiosyncratic black comedy with Three Kings and I Heart Huckabees, Russell here sublimates any writing/directing eccentricities for unadventurous formula. Slant's comment is fundamentally correct. The Fighter, at least ultimately, is optimistic, obvious and formulaic. If I knew more of the real story, I'd bet it glosses over a few things too. But as I said, that is unavoidable in a film like this. A true life sports movie? It's got to wear its heart on its sleeve otherwise it just can't work. Slant are being unfair and letting their disappointed snobbish opinion of Russell blind them ("but he's an artist. Why is he doing something the peasants will actually enjoy?"). So he did edgy films before, and I love Three Kings, not so interested in I Heart Huckabees, but it doesn't matter. When a director as capable and interesting as that works with something seemingly straightforward, they bring something special. Like when Darren Aronofsky did The Wrestler. Or even Herzog doing Bad Lieutenant. I wonder what they wanted from the film? For it simply to not exist? The choices are let someone like James Mangold or Ron Howard churn out another glossy TV movie no-one will remember, or ask a visionary to slum it and find something special. I prefer the latter and I won't sneer, because I loved this film. They insinuate Russell didn't try, but my word he did. Film 2011 pointed out last night an early scene with Dicky in a crack house, re-enacting his famous knock-down of Sugar Ray Leonard with his crack-head mates. I just found it astonishing. Overall the screenplay is superb and borders on subversive. True, it isn't as interesting by the end, but Russell still works it for everything it's worth. Amy Adams works her part well too, despite it being smaller in comparison to the other leads. Her attitude against the women of Micky's family is brilliant. That's the girl you don't want to take home, but you should, because she'll be good for you! Ebert also has a ring of truth with Whalberg, but again, he's being unfair. A brief clip at the very end shows both real brothers and the two leads pitched their roles perfect, it seems. Whalberg works the silence between the more showy characters and never, as far as I feel, loses your attention. Knowing when to keep your mouth shut can be as tough for an actor as showing off. I don't like boxing and don't follow it at all..but I really liked this movie. I do think it is one of the best movies of the year. Bale definitely deserves the awards he's getting. He was great in the part..though a bit creepy looking at times. But that fit the character. I do think Wahlberg is really good too.